Rot is extremely damaging to a fence because it shortens the lifespan of your fence. A fence is a fantastic way to enhance the curb appeal of your home and yard. 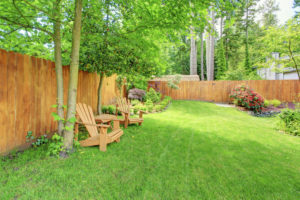 Your fence is doing so much to help boost the aesthetic of your home, so you should be doing whatever maintenance is required for your fence. One thing you can do to take care of the fence surrounding your home is helping to protect is from soil damage. Not many people know how to protect their fence from soil damage. If you are one of these people, you will soon no longer have to worry because here is what you should know about that. Your fence rotting is a threat that you must always be worried about because of prolonged exposure to moisture in the soil. Rot is extremely damaging to a fence because it shortens the lifespan of your fence. It is not as easy as simply replacing the part of the fence that has begun to rot, because the replacement will also be subject to rotting because of the place it is in. Direct contact between the bottom of the fence and wet soil will allow rot to continue, so you will want to take precautions to keep your fence dry. Pressure treated wood can be of great service in protecting your fence from soil damage. For starters, pressure treated wood can help protect your fence against the previously mentioned rot. You will also be protected against decay caused by insects and other types of weather damage. Thanks to pressure treated wood, your fence will be able to stay healthy for a longer period of time, and the lifespan will be expanded. Although it will cost you more money, it will be worth every penny in the long run. Another method of protecting your fence from damage is by making sure your fence is installed by a professional. A professional installer has a professional eye, so they can see possible disasters or problem points before they even install your fence. They can help provide you with everything you need and help teach you everything you need to know to protect your fence from soil damage. This entry was posted on Thursday, January 31st, 2019 at 3:37 pm. Both comments and pings are currently closed.